Sun, Apr 7, 2019, 08:20 pm SL Time, ColomboPage News Desk, Sri Lanka. 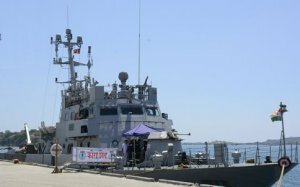 Apr 07, Colombo: Sri Lanka Navy in compliance with naval customs ceremonially welcomed the Indian Navy Ship (INS) Cora Divh arrived at the Port of Trincomalee on Sunday (07 April) on a goodwill visit. INS Cora Divh, a water Jet Fast Attack Craft, is a 48.9 m long ship with a displacement of 293 tons. The vessel is manned by 61 officers and sailors. During their stay in the island, the crew members of the ship will take part in several events organized by Sri Lanka Navy. The ship is scheduled to leave for her next port of call tomorrow (08th April).